Does Jason Peters have another year left in him in 2017? You got one more left in you, JP? 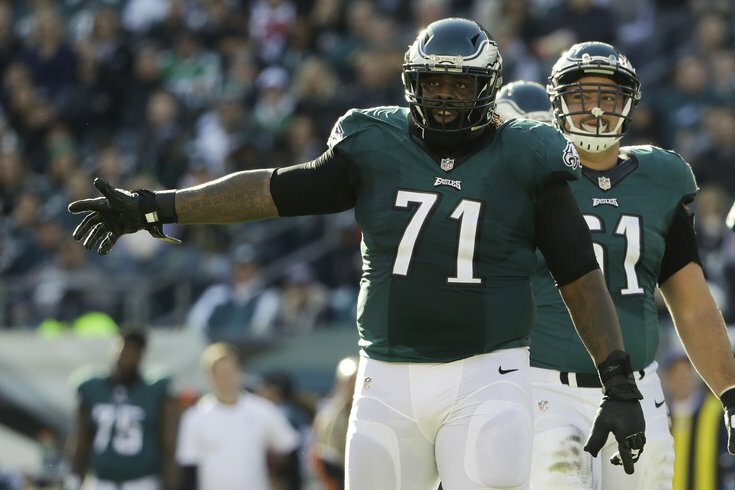 A couple weeks ago, we took a way too early look at the Philadelphia Eagles' offseason needs, and determined that offensive tackle was at the top of the list. The premise for that assertion was that Jason Peters will turn 35 in January, and this could be his last season in the NFL. Whenever Peters decides to call it a career, Lane Johnson will take over at left tackle. Johnson, of course, would face a minimum two-year suspension with a third failed test for performance-enhancing drugs, which has to remain in the back of the minds of the Eagles' front office. With Johnson currently serving his 10-game suspension, rookie fifth-round pick Halapoulivaati Vaitai has filled in at right tackle. Vaitai's first performance of the season against the Redskins was obviously bad, and while he has improved as he has gotten more experience, the game film shows a player who is still struggling. Obviously, having good pair of bookends opens up the playbook and what the Eagles can do offensively. They make every player on the offense look better, which is something that is crucial for a team that is going to have to overhaul their under-performing skill position players. But what if Peters can play another season? The question was posed to him post-game after the Eagles' win over the Atlanta Falcons. "I don’t know man, I’m just chasing a dream that everybody who plays this game does, to get to a Super Bowl," he said. "I told coach I’m year to year, and I’m not leaving until I try to get that ring." While the Eagles are an improving team capable of beating quality opponents, the ring is unlikely to come in 2016. However, they do have pieces in place. The Eagles have a long-term answer at quarterback in Carson Wentz, a very good defense, and perhaps the best special teams units in the NFL. "If we run the ball like we did today, it's going to be hard for teams to beat us because we have a good defense," said Peters. "As long as we're running the ball, Wentz, obviously he can throw the ball well so he's going to be good for us." While Peters is no longer the elite player he once was, he's still pretty freaking good, and a whole lot better than most left tackles you'll find across the NFL. Peters' 1.5 sacks allowed are very impressive, considering the Eagles have truly left him alone on an island to block opposing rushers mano-e-mano, while often giving added help to Vaitai on the other side. During training camp and throughout the season, Peters has gotten special treatment during practice. The Eagles make a concerted effort to give him more breaks than the rest of the players on the team, which makes sense for a 34-year old player who has earned the level of respect that Peters has over a stellar 13-year career. Nine games into the season, Peters feels better than he has the last few years, which he attributed to his lighter practice workload under head coach Doug Pederson. "I feel real good this year," he said. "Coach takes care of me during practice. When I’m in I practice hard all through the week. I miss two or three plays here and there during the week, and it just keeps me fresh for Sunday. I feel better than I’ve felt in a while." Offensive coordinator Frank Reich commented on Peters' workload and had extremely high praise for what Peters still is as a player. "I mean, he and Stout and Coach Pederson have a good understanding," said Reich to reporters last week. "It's not that he doesn't want to work. I love the way he works. At the end of the week when you go back through the practice film, I get amazed, and I've shown this to the offense once or twice. You look at how hard he practices on the reps that he's taking. From a coaching standpoint, you look at the athleticism that he still has in his body. I mean, it's really astounding to me. He's got a lot of athleticism left in that body. I don't know how many plays he has left. But I really don't see any signs, and I wasn't here when he was in his prime, but he might be the best offensive lineman I've ever coached. The guy is awesome." Can Peters be "awesome" for one more season? It would sure help the Eagles attack some of the other glaring holes (cough, wide receiver and cornerback, cough) on their roster this upcoming offseason.